Benni McCarthy After some stinging criticism of his form and attitude from manager Mark Hughes, McCarthy bounced back with two goals against Reading. Antii Niemi The Finnish keeper salvaged a point for 10-man Fulham against Derby with a series of fine saves. Kenwyne Jones Sunderland’s best player by a mile against West Ham, and didn’t deserve to be on the losing team. He was a constant threat in attack and looks well-suited to the Premier League. 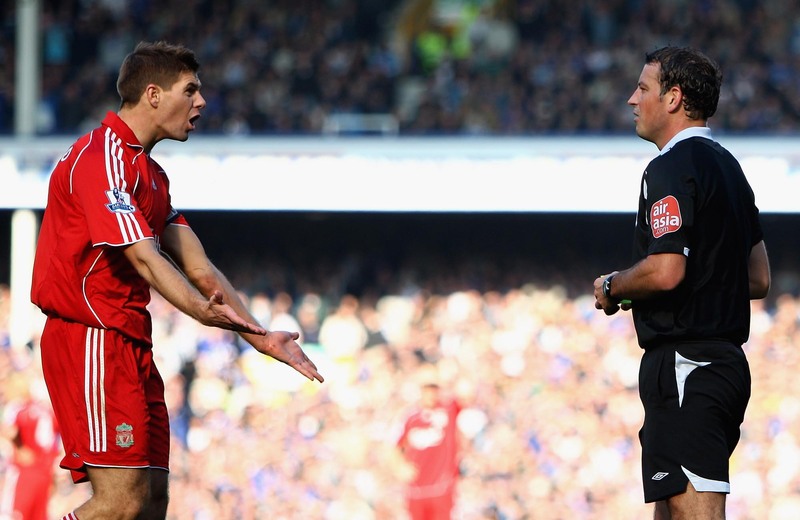 Mark Clattenburg Clatters (pictured above with Stevie G) had an absolute shocker in the Merseyside derby and mysteriously won’t be reffing a Prem match this weekend. Not that he’s been dropped, oh no. Didi Hamann Banned from driving for six months and told to pay more than Â£7,000 in fines for a series of motoring offences. The German crashed his Porsche into a fence in Cheshire, in 2006, but did not report it to the police. Naughty. Paul Konchesky Probably cost Fulham a win when he was sent off for a stray elbow on Craig Fagan in the first half against Derby.